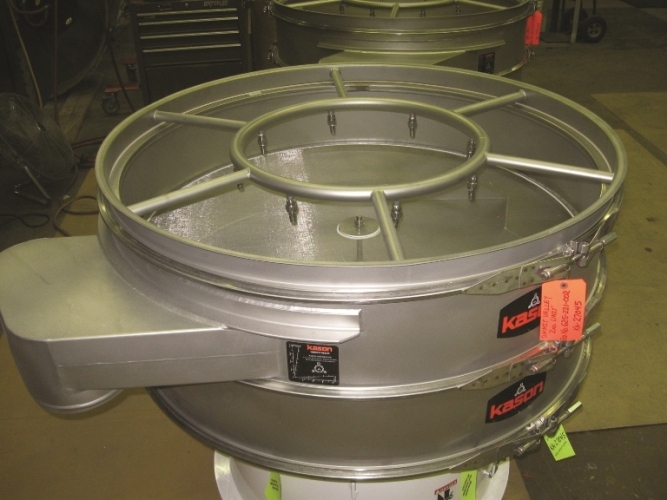 MILLBURN, NJ—Kason has introduced a new Vibroscreen® Dewatering-Clarifying Screener with anti-blinding spray-wash system for separating solid materials from liquids at high rates on a batch or continuous basis. The unit contains a 48 in. (1219 mm) diameter screen in a cylindrical housing supported on a circular base by rugged springs. An imbalanced weight gyratory motor affixed to the housing imparts vibration, causing solid particles to move across the screen and exit through an upper discharge spout, as liquid flows through screen apertures onto a tapered pan and exits through a lower discharge spout. A manifold positioned above the screen feeds eight nozzles that spray liquid in wide conical patterns continuously or on a timed cycle, preventing solids from blinding the screen. The unit functions both as a “dewatering screener” when separating a small- to medium-percentage of liquid from a large percentage of solids, and as a “clarifier” when separating a small percentage of solids from a large percentage of liquids. It is constructed of epoxy-coated carbon steel, and available in stainless steel to 3-A, FDA, BISSC and other sanitary standards, as well as to UL, ATEX, CSA and CE electrical standards. The unit is offered in diameters from 18 to 100 in. (460 to 2540 mm) with four to 12 spray-wash nozzles depending on screen diameter. The spray-wash system can also be retrofitted to circular vibratory screeners of any make and model. The company also manufactures circular vibratory screeners for dry bulk solids, as well as centrifugal separators, and circular fluid bed dryers, coolers and moisturizers.